The GPD Global Magazine Loader and Unloader are available as stand-alone or attached models. Automatic loading and unloading greatly increases system throughput providing a continuous supply of product to the dispense system. The Loader and Unloader are easily adjusted to accommodate a wide range of magazine sizes. The parameters for pitch and number of units is easily changed via the touchscreen interface and may be recalled for future use. The Loader and Unloader are commonly used to present products such as lead frames, BGA substrates, micro BGA strips, and singulated components in boats or fixtures. All auto loaded products benefit from decreased operator handling by reducing accidental interaction with the product or dropping costly parts. Safety features such as jam detection notify an operator of an error via visual and audible alarms. 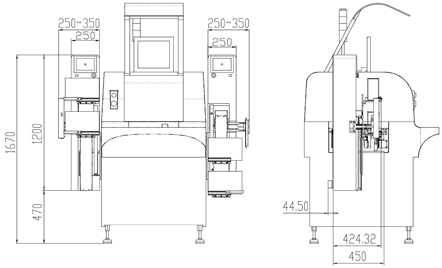 Capacity of attached Loader: Two (2) magazines up to 300 x 100 x 200 mm each (11.81" x 3.94" x 7.87" each). Input / Output buffer of stand-alone Loader: 300 mm x 200 mm (11.81" x 7.87"). Holds as many magazines as will fit in this area. Maximum size for a single magazine: 300 mm x 200 mm. Both styles of Loader can be loaded with new magazines without stopping production. Similarly, empty magazines can be removed from both styles of Unloader without stopping production. The floor-standing Loader and Unloader are compatible with third party systems through SMEMA communications. Because they comply with SMEMA standards for height adjustment, they are easily aligned with other systems. Once in position, optional locking brackets can be used to prevent movement due to operations and accidental bumping. During product presentation, a pusher mechanism in the Loader helps feed product to the target conveyor. In some instances, additional rollers or feed wheels may need to be mounted to the target conveyor. Likewise for the downstream Unloader, a pusher mechanism interfaces with the transport conveyor to help insert product into the empty magazine. Stand-alone Loader and Unloader Operations - video. Side-mount Loader and Unloader Operations - video. The Loader (upstream), responding to a downstream request via SMEMA communications, automatically presents and ejects product from magazines onto a downstream equipment conveyor. 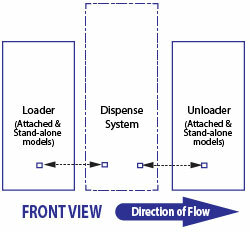 The Unloader (downstream), after requesting a product and receiving a signal from the upstream conveyor through SMEMA communications, automatically inserts product into an empty magazine. Magazines are accessible from the front of the machine. Magazine transfer occurs in less than 15 seconds. Quick changeover to different sized magazines. Magazine controller for slot pitch, product count, and start-point. Touch screen interface with on-board message center. The optional heated conveyor module is a single lane transportation unit. 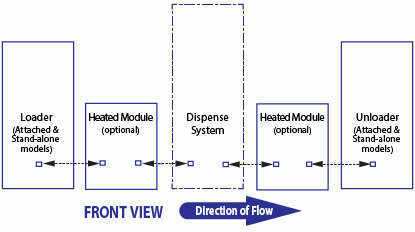 It is designed to preheat a product before transport to a dispensing system. The use of the heated conveyor module can reduce cycle time by accomplishing the time-consuming process of heating a substrate while another is being processed by the dispense system. Heating is done via forced air and radiant heat to accommodate a wide range of product geometries. Contact GPD Global for more information.